The Finnish article originally published in Sporttirakki online media in 11th of December 2017. All pictures and picture copywrite belong to SporttiRakki / Heidi Hendrell. Agiliikkari is agility training tailored especially for kids (and seniors), which focuses on the joy of exercise. 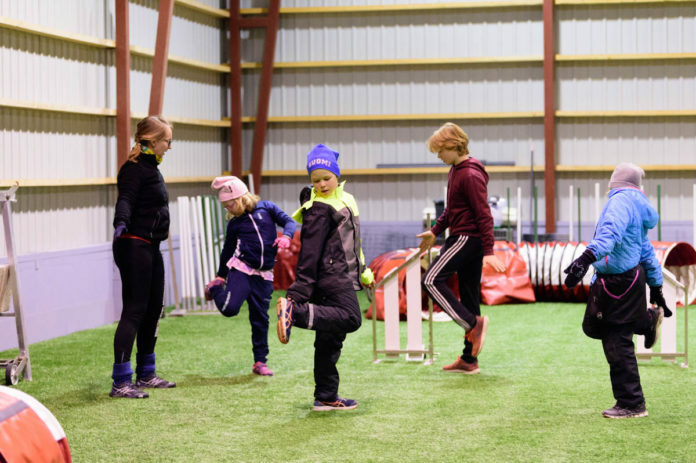 In 11th of December 2017 SporttiRakki went to see this new kind of children’s physical education class “liikkari” in Mynämäki, where agility coach Hilma Larkela, the founder of the idea, runs a continuous weekly training classes for a group of children. A group of four 6-13-years-old kids attend Agiliikkari classes regularly in Mynämäki. A regular group of four 6-13-years-old kids had been attending actively the Agiliikkari classes in Mynämäki for over a year now: Senna 10-year-old, Aapo 8, Samuel 13 and Hilma’s own daughter Essi 6. In these classes, one practices agility skills through many different and versatile exercises, where only a little portion is done with a dog and the rest together in group exercises. To the classes, kids bring their own dogs. These dogs are usually experienced in agility, so the kids can learn the agility techniques with an experienced dog at their own pace. 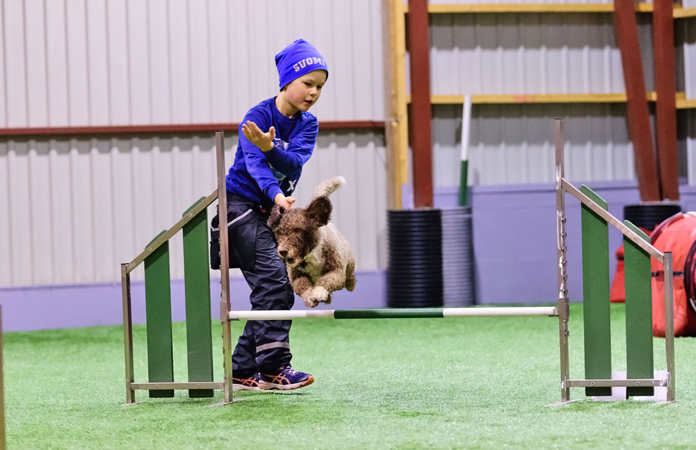 “After Funna®, it is much easier for kids to continue the agility hobby in other groups and start handling an inexperienced dog”, Hilma tells about the main objective of her lessons. In Funna®, kids learn agility skills, which later makes the transition to other agility groups easier. “Where am I going, where am I going? Tell me already!”, asks the coach Hilma from Aapo, as they run together around the course, Hilma playing a dog and Aapo taking the role of a handler. In Funna®, the lessons start with learning the course together with the whole group and the course plans are always first tested without a dog. Hilma challenges the kids imagine how the course and the course plan might look in the dog’s eyes. Does the dog see the cues, do the directions come in too late and are they clear for the dog? The kids think what the best turns and routes for their own dogs are. Visualization and mental exercises alone and in a group are an important part in every Funna® class. 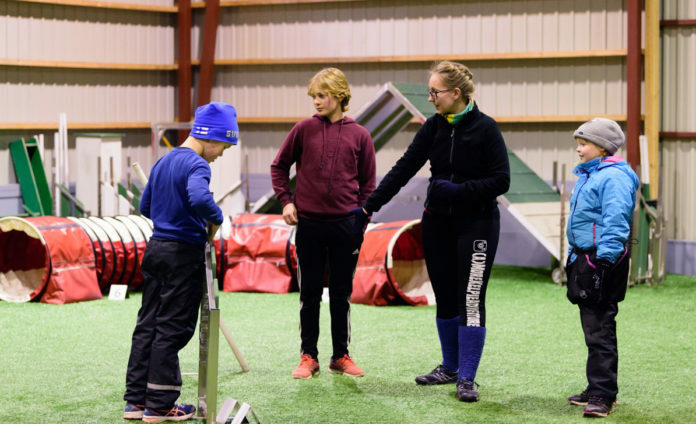 In Agiliikkari kids learn agility handling through games and fun. Actually, the time on course handling the dog is just a minor part of the lesson: Each dog spends only 2-5 min in the actual course. Instead, the main focus of the Funna® Agiliikkari classes are motor skills and the varied exercises for the kids. In practice it means performing a long warm up in the beginning and at the end of the class with group. The exercises strengthen the child´s balance, coordination and running technique as well as muscle maintenance and body awareness. The entire lesson is active and it keeps the kids on a move, increasing the heart rate for 30-40 minutes. Hilma herself has a strong sporty past that can be seen in the versatile structure of the classes. She has previously led a group of baby-parent gym and has now included some of the gymnastic exercises in the Funna® training too. In Funna® Agiliikkari kids get to improve their motor skills, coordination and balance. In Funna® lessons, the learning happens in child’s terms. Children think that the end warm up is especially fun because everyone in the group has a chance to come up with an own exercise that everyone participates in – the adults too. “When you get sweaty and you have fun” and “You can come up with some moves yourself” are the common answers when you ask the kids what the funniest thing in the classes are. 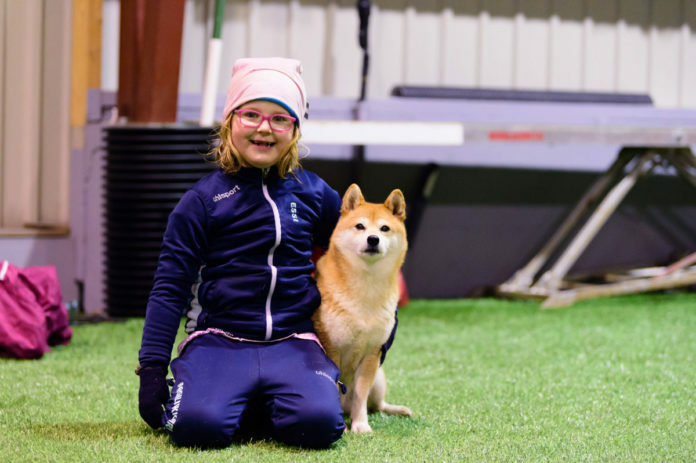 Agiliikkari seems to be an excellent group form where children can experience both the glee of exercise and joyous activity with a dog and learn a lot about their motor skills and responsible ways to practice. Thanks to for Sporttirakki for visiting our class and writing the article! The Funna® Kids: Meet Fabian! If your interested to support our cause, show it and take a tour in our merchandice shop.